These days, “lightweight” is arguably the most popular word in the automotive industry. Improving fuel economy is at the top of every automakers list, and the easiest way to make that happen is to reduce the weight of the vehicle. Lighter materials like carbon fiber and aluminum are one choice, but they aren’t the answer in every lightweighting situation. And they also tend to be expensive. Fortunately, weight reduction can also be achieved by using less material. One of the traditional ways to lightweight vehicle components is to poke holes in them. Lightening holes, which first found their way into racecars in the 1920s, are holes in structural components used by a variety of engineering disciplines to make structures lighter. The edges of the holes can be flanged to increase the rigidity and strength of the component; the holes can be circular, triangular, oval or rectangular in shape with rounded edges. Sharp corners risk the appearance of stress risers and must not be too close to the edge of a structural component. Therefore, the challenge of introducing lightening holes in vehicles is determining which components can withstand weight reduction – and by how much – and still maintain their integrity and satisfy customer expectations for vehicle durability and performance. If there are too many holes, it can cause problems with rigidity, durability and, perhaps, even safety. DesignLife’s Seam Weld option enables the fatigue analysis of seam-welded joints, including fillet, overlap and laser welded joints. The method is based on the approach developed by Volvo and validated through years of use on vehicle chassis and body development projects. According to the FCA US engineers, CAE fatigue simulation is widely used in frame design before the physical proving ground tests are performed. A typical frame durability fatigue analysis includes parent metal fatigue (PMF) analysis and seam weld fatigue (SWF) analysis. Usually, the gauges of the frame components are dictated by the SWF performance so opportunities for weight reduction may exist in areas away from the weld. One method to reduce frame weight is to cut lightening holes in the areas that have little impact on the frame fatigue performance. The white paper proposes a new methodology to identify the locations of these noncritical areas in which holes can be added while the vehicle frame still maintains good durability. A light-duty truck frame was used for demonstration. With the new lightening hole approach, engineers were able to reduce three to five percent of weight on components of a frame without compromising the frame durability fatigue performance. Adding to the challenge of removing material, a light-duty truck frame has a lot of welded joints. The welding process usually causes these weld joints to have different fatigue properties compared to the parent materials. 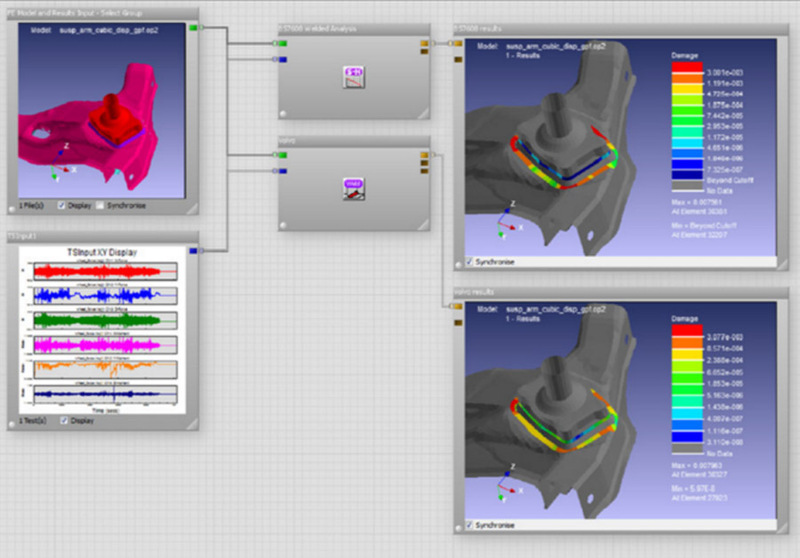 The Volvo method used by nCode software from HBM Prenscia has been widely adopted in automotive CAE simulations to predict the seam weld durability lives in the welded joints. The reason the seam weld exhibits lower fatigue life than the parent metal is because the seam weld areas typicallyhave notches at roots and toes as well as heat effect and high residual stresses introduced from the welding process. Thus, seam weld areas usually have higher fatigue damage than nearby parent metal under the same loading conditions. For a well-designed frame, the gauges of the parent metals are specified to meet the SWF durability performance. Because the gauge of the seam weld elements is determined by the gauges of its two parent plates, any direct gauge reduction leads to lower section properties on these welded joints and compromises the seam weld durability performance. It’s important to note, however, that the lightening hole approach has no such limitation. The gauges of parent plate remain the same and the section properties on the welded joints also remain the same. If the holes are strategically placed at noncritical areas, the frame durability performance can remain at the same level, as well. To identify the noncritical areas, the FCA US engineers use PMF analysis. The areas that have zero fatigue damage throughout the complete duty cycle events in PMF analysis are good candidates as they show little or no contribution to the durability performance of the frame. Showing no fatigue damage at all, these areas are the ideal candidates to place the lightening holes. To avoid compromising SWF performance, however, the lightening holes should be at least 20 mm away from seam weld areas. Additionally, as fatigue is mostly a local phenomenon, the shape of the holes should be carefully planned so as to not add new local fatigue issues. 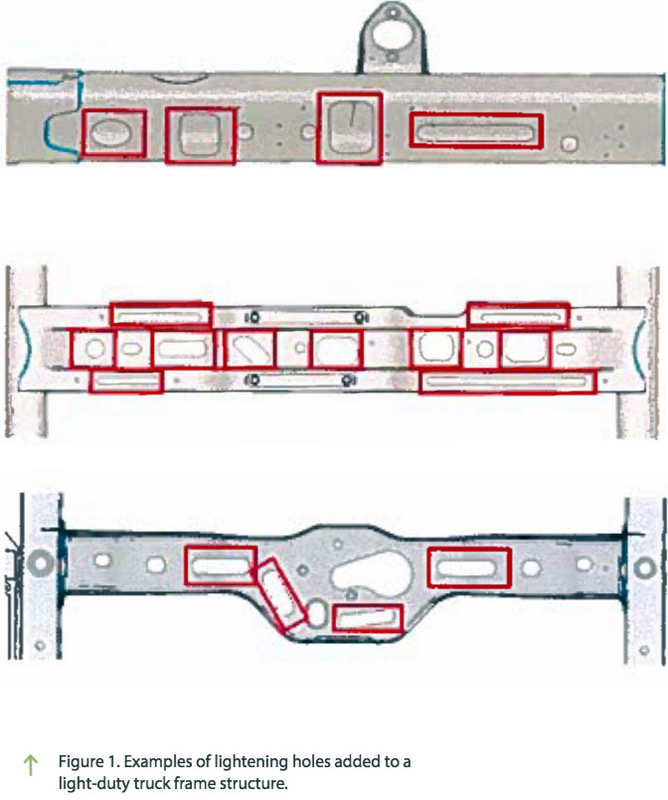 Figure 1 shows examples of lightening holes that were added to the frame structure using this approach. Before the lightening holes are introduced, the newly proposed frame needs to be validated with PMF and SWF performance targets under original material and loading conditions. Iterations may be needed to address new fatigue issues or determine new hole locations to achieve a design optimized for performance and weight. 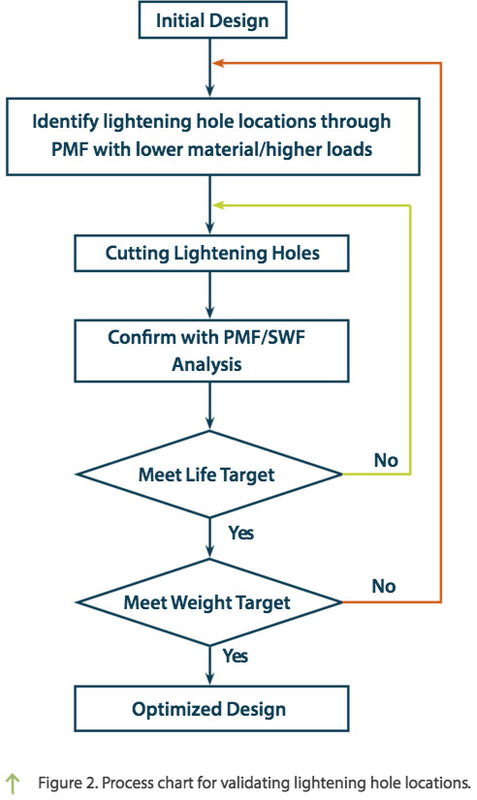 The process chart for this lightening hole approach is shown in Figure 2. The lightening hole approach was applied to a baseline truck frame and achieved good weight savings results. Three iterations of weight reduction using the lightening hole approach were carried out, but the end result removed almost 15 lbs. of weight from the baseline frame. The final lightweight design frame was confirmed with both SWF and PMF analysis and it was able to maintain the same durability performance as the baseline design. According to the white paper, FCA US engineers concluded that the new lightening hole approach that uses fatigue performance as the design target to optimize the light-duty truck frame works. Compared to other optimization processes, which typically convert fatigue targets to other design targets, such as stress targets, the lightening hole approach directly uses fatigue targets in the process. It eliminates the need to create intermediate targets and simplifies the whole process. Considering the various methods to remove weight from a vehicle, the FCA US engineers are rarely caught twiddling their thumbs. In fact, the lightening hole process was one of 24 technical papers the engineers presented at the annual event. In addition to presenting its engineers’ numerous findings, FCA US also co-sponsored the Leadership Summit at WCX 2017 where industry stakeholders discussed a wide range of topics, including the growing importance of weight reduction. As some may already know, FCA US is a North American automaker with a new name but a long history. As a member of the Fiat Chrysler Automobiles N.V. (FCA) family of companies, FCA US designs, engineers, manufactures and sells vehicles under the Chrysler, Jeep, Dodge, Ram and Fiat brands. Based on total annual vehicle sales, FCA is the seventh-largest automaker in the world. Body structure is the core of a vehicle platform. Today, engineering a new body structure requires automakers to consider critical attributes, such as occupant safety, fuel economy, performance, comfort and convenience, and cost of ownership. The completely re-engineered 2017 Chrysler Pacifica checks all those boxes. Lighter by approximately 250 lbs. (model to model), stiffer and more aerodynamic than the outgoing model, the 2017 Pacifica has functionality, versatility, technology and style. “FCA US is committed to designing and producing lighter, more fuel-efficient vehicles that still meet the demands of our customers,” said Phil Jansen, head of product development, FCA – North America. 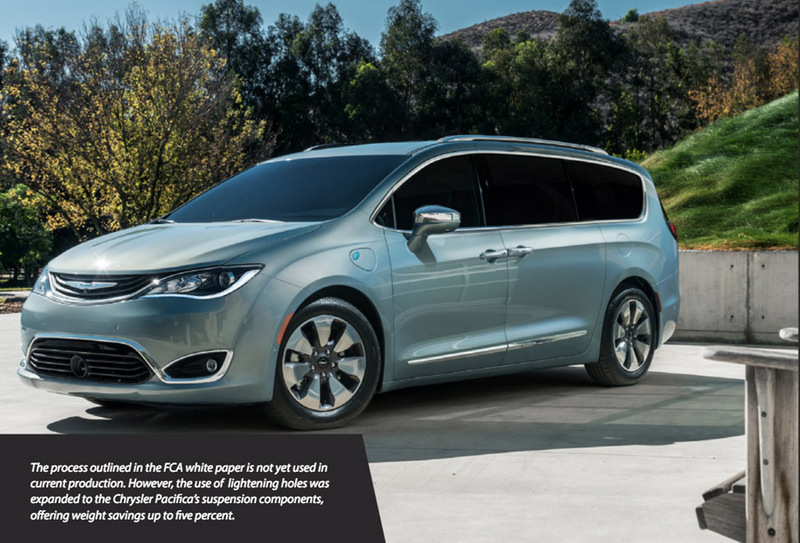 “The all-new 2017 Chrysler Pacifica meets these criteria. Not only is it 250 lbs. lighter than the vehicle it replaced, the Pacifica is larger and stiffer. “Such progress bodes well for our ongoing investigation of strategic material placement,” Jansen added. The light yet stiff unibody structure is based on the new FCA vehicle architecture developed specifically for the minivan global front-drive E-segment. The upper body and frame are engineered as a single unit, enabling a more mass-efficient and stiffer structure. Much of that credit belongs to the extensive use of advanced, hot-stamped/high-strength steels, application of structural adhesives, where necessary, and an intense focus on mass optimization. The Pacifica utilizes approximately 22 percent more high-strength steel than its predecessor, of which 48 percent is advanced high-strength steel for maximizing stiffness and strength while optimizing weight efficiency. Another area where the vehicle has been lightweighted is the optimally sized cross-vehicle instrument panel beam constructed of magnesium. This enables a stiff and light structure while the liftgate, constructed of magnesium (inner structure) and aluminum, represents the first high-volume application. It’s exclusive in the Pacifica’s competitive set.